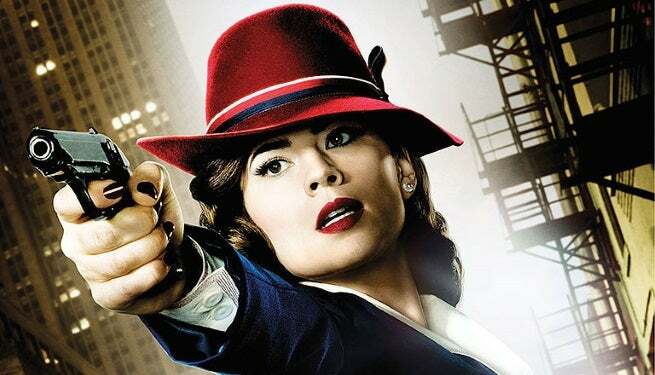 Last week's episode of Marvel's Agent Carter was chock full of Easter eggs, in-jokes, Marvel Comics cameos and references. And because we were all so focused on the Ant-Man trailer, we didn't get around to pointing them all out that night. So if you're of a mind, fire up your DVR, Hulu, Amazon or iTunes and watch along with us while we point out the ones we spotted. And, as always, tell us what we missed. We do these on the fly as the show airs, so it's rare we catch everything and often the fans get some really cool stuff we didn't. Even though we're running this the next week, it's sourced from our original list! That said, there's a lot of this and you've already seen this episode more than once if you liked it as much as I did, so we're going to blitz this puppy and get a better handle on the next set tonight. As ever, we'll point out familiar Marvel faces on their first appearance but not thereafter. Leet Brannis: The Leviathan agent who died was, in the comics, a mob boss who used to square off with the super-speedster known as The Whizzer. Anton Vanko: The father of Iron Man 2 villain Whiplash, Anton Vanko has suited up as the Crimson Dynamo in the comics. Roger Dooley: Here, the director seems like an alright-ish guy. In the comics, he only had one appearance, during which time he made racist remarks about Wyatt Wingfoot, tried to force She-Hulk to submit to a strip-search and was ultimately possessed by, and then killed by, a swarm of cockroaches. Comics are weird, guys. This is the same oil company that's been seen periodically throughout the Marvel Cinematic Universe, and are often associated with evil types. During the speech where Jarvis gently admonishes Peggy for attempting to "remove herself from the world she's trying to protect," all I could hear was Alfred Pennyworth. Maybe intentional, maybe not, but apparently that's the duty of all comics butlers. Vita-Rays are a part of the Super-Soldier Serum that speeds up the potion's effects and makes them work correctly. They were created by Abraham Erskine. The only Vita-Ray machine was destroyed, which is why Cap is one of a kind...but there are Vita-Rays all over the place in this show. The "Rebirth" files refer to Operation Rebirth, which was responsible for making Steve Rogers into Captain America. With Vita rays in play and the idea that some of the Super Soldier Serum was still around in The Incredible Hulk, one has to wonder whether we might see William Burnside (the Captain America of the '50s) in the show or at some point down the line. The audio drama recounting a glamorized version of Captain America's story gets one big thing right: The 107th is the company he rescued (Bucky's company) during the War in Captain America: The Winter Soldier. Even though the events themselves aren't similar (at least yet), one has to wonder just how much other crap Howard is hiding from Tony, considering that in the comics his action-hero past came to light as well...and with it some pretty messed-up revelations. When she goes undercover with blonde hair at the club, she looks like the Peggy from the comics. Nice touch. The Leviathan agents are referred to as "Quiet Men" at least once in the script, which of course brings to mind The Quiet Man...except that he's almost certainly not allowed in the Avengers-verse, because he's a Fantastic Four villain and is probably held by Fox. In the comics, Leviathan is a HYDRA-like organization that was born out of the communist bloc in the same way HYDRA was built out of the Reich. Most recently their influence and size was significantly diminished during a three-way war between HYDRA, Nick Fury and Leviathan during Marvel's Dark Reign event. In a recent interview, Agent Carter's Butters and her husband Marc Guggenheim, producer of Arrow, suggested that if there was ever to be a crossover between the two, it would likely be a very detached kind of wink-and-a-nod affair, a la the Picket Fences/X-Files crossover. "Picket Fences was on CBS and X-Files was on Fox and the networks wouldn't allow it," Butters explained. "So they had FBI agents who came in to Picket Fences who were originally supposed to be Mulder and Scully who they just recast." Well, if they wanted to do something like that, this season's Arrow big bad is Ra's al Ghul, whose daughter Talia was wrapped up with an organization called Leviathan during the Grant Morrison run on Batman Incorporated.